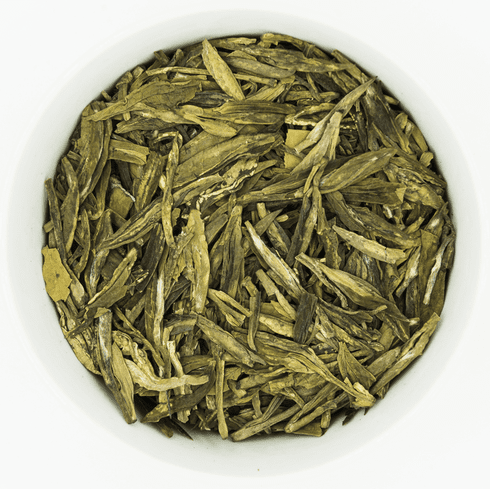 Ten Tea's Organic Dragon Well 1st Grade is grown on a pristine and naturally clean island in China. Although this tea is not grown in the originating area of Dragon Well, the West Lake region, the methods used to farm and process this tea are the same. In addition, an independent agency in Europe has certified that this tea has been grown with organic farming methods with no chemical pesticides used in cultivation. Tea steeped from these leaves have a faint fresh and pure aroma. The color of the tea is golden yellow. Its taste is lightly sweet and fresh while its aftertaste is long lasting pure and sweet with slight roasted undertones. The water used to steep this tea should be about 160-180�F or 70-80�C to prevent scalding the leaves. Use about 1 tablespoon (3 grams) of tea leaves for about every 5 ounces (150 ml) of water. A steeping time of about 3-5 minutes is recommended with more or less time depending on the desired concentration. As a rough guide, the higher the temperature of the water or the greater the amount of leaves used, the shorter the steeping time should be. The use of a covered glass or ceramic cup is recommended for steeping in order to appreciate the tea leaves. This tea may be infused 3 or more times.